The client is a 50-year-old renowned drilling services provider with a huge list of customers consisting of global oil and gas producers. With a corporate headquarter in Lyngby, Denmark, the client has made a name for itself as a leading provider of high-efficiency drilling services. As a valuable partner to their growing list of customers, the client focuses on technology, safety, and innovation. The client boasts of about 4000+ human resources on board to provide the best service possible as a North Sea leader. Operating few of the world's largest as well as most advanced harsh environment jack-up rigs at about 150 meters water depth, the client is skilled and committed to delivering excellence. The client needed an engineering support services provider to help them bring their legacy equipment drawings to match latest company standard. The tasks had to be carried out by a team of skilled resources with rich experience in industrial equipment to ensure accuracy in the drawings and properly marked revisions. The client with a focus on accuracy and details needed a support partner that can match their quality standards. The challenge was to study and recreate the industrial equipment drawings from old PDFs with illegible markings. Outsource2india helped an extensive list of clients with drawing conversion projects and has served a wide range of industries including oil and gas, manufacturing, construction, infrastructure, etc. We appointed a team of 3 skilled resources along with the quality manager and accounts manager to ensure high-quality drawing delivery to the client. We set up a proper communication strategy to avoid expectation mismatch while converting the drawings that met company's latest standards. We converted about 1200 drawings in 20 days and ensured each drawing met the quality specification and pleased the client. At Outsource2india, we follow international quality standards to ensure highly accurate project delivery at any given time. We create a 3D part models which can be modified at any given time, allowing you to take charge of any alterations without spending excessively on different prototypes. We have helped many enterprises to update their legacy data to match the advanced quality and MEP standards. 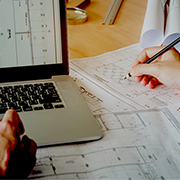 Contact us today to understand how we can provide you with editable, highly accurate, and easily storable engineering drawings at an affordable cost. Outsource2india's CAD conversion services can help you convert any paper-based drawings into electronic format for increased efficiency and performance. We have 20 years of rich industry experience along with a well-qualified team who specialize in sophisticated conversion and digitization tools. Our solutions are widely applicable in bringing measurable ROI to your business. We make our services highly affordable and reliable giving you more than a few reasons to choose us. You can also explore other services we offer such as CAD migration services, paper to CAD conversion services, and more. If you have CAD conversion requirements, reach us now and let's get started.